Throughout his career, in films such as Landru (1963), Les Bonnes Femmes (1960) and Les Noces rouges (1973), Claude Chabrol drew on true crime as a source of inspiration. His depiction of the Violette Nozière case follows the facts closely but the story is presented as a mystery with the ultimately unknowable Violette at its centre. Was she the self-centred nymphomaniac and cold-blooded murderer that the newspapers of the time painted her as, or a naïve young girl, scarred by incestuous abuse and pressured by her boyfriend into acts of criminality out of youthful infatuation? We will never know and Chabrol wisely refrains from speculating. The narrative does suggest a number of possible motivations for her crime, whether sexual, financial, or moral, but reaches no definitive conclusion. The searching close ups of Violette’s face that recur throughout the film and the flashbacks to intriguing incidents in her childhood lead us to imagine that something critical is about to be revealed, but in fact it never is. As she tells the police, “There is nothing to understand”. 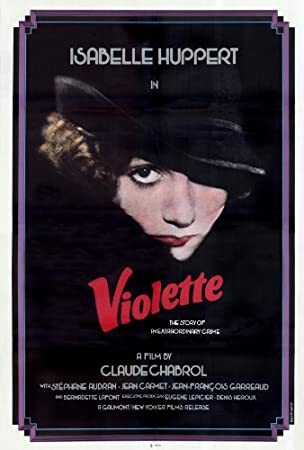 Violette remains a mystery, enigmatic to the last. Even her apparent rejection of petit bourgeois values – something the surrealists praised her for at the time (‘Violette dreamt of undoing/Undid/The hideous nest of snakes that is blood relations’ Paul Eluard wrote) -- was later reversed by her early release from prison for good behaviour and subsequent marriage and motherhood. When we first encounter Violette, sneaking out of the front door of her block of flats late at night, she seems like any other rebellious teenager, desperate to enjoy the freedoms of adulthood without yet quite being an adult. The young blades in the local bar with their petulant arguments over politics don’t impress her. “I need words that make me dream,” she confides to her friend Maddy. She wants to escape the tiny, constricted flat she shares with her parents for a more glamorous existence. Her relationship with them is compromised by secrets, including the fact that Violette’s real father is not the man her mother is married to. Seeing everything, the teenager has become mature beyond her years and used to getting her own way until she, in turn, is manipulated by the unscrupulous Jean into committing ever more extreme acts. Jean is Violette’s blind spot – the man of her dreams who will make her fantasy of driving to the coast in a Bugatti sportscar a reality. Violette’s fantasies are her undoing. Again and again we see her staring at her reflection in the mirror, adjusting her make-up, but looking no further. Self-recognition only comes later. Mirrors are used brilliantly throughout the film to suggest dreams and fantasy. In the restaurant where Violette meets her real father Emile, a man belonging to the higher social class she would like to belong to, we see him reflected in a mirror above her head as if he were merely an image in her mind. In the cheap hotel room where she meets with men, she play acts in front of the mirror, kissing it and pretending it is Jean. Mirrors undermine our sense of reality. Frequently, we see what we think is the real Violette only to discover we are actually looking at a reflected image, further fragmenting our already contradictory view of her. The more we see of her the more mysterious she becomes. In Isabelle Huppert, Chabrol found a young actress uniquely capable of conveying Violette’s enigmatic ambiguity. Huppert deservedly won the award for Best Actress at the 1978 Cannes film festival for her performance and it remains one of the highlights of her career. It’s a testament to her skill as an actress that she portrays such a complex character so convincingly, and in a way that evokes sympathy from the audience. Chabrol demonstrates once again how anybody, given the right circumstances, might be capable of committing murder, but in this case, might also have a change of heart and ultimately find redemption.